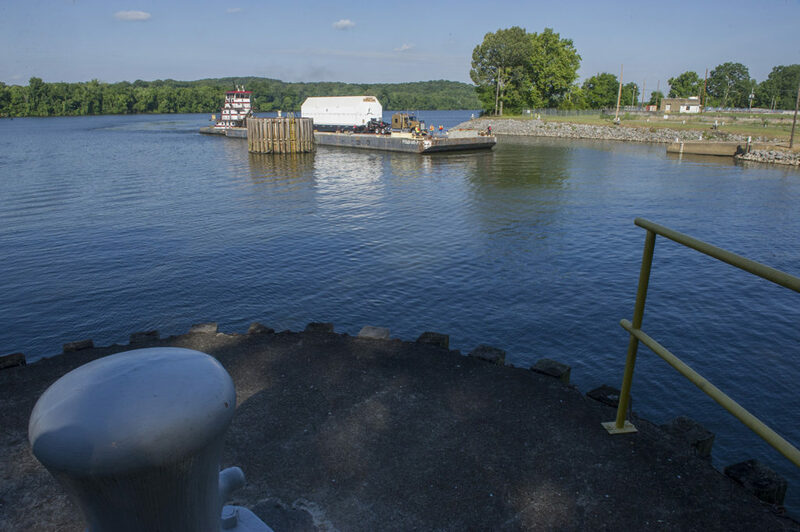 June 21, 2016 – A key piece of hardware for NASA’s new rocket, the Space Launch System (SLS), completed a five-hour journey by barge June 19 along the Tennessee River in North Alabama. 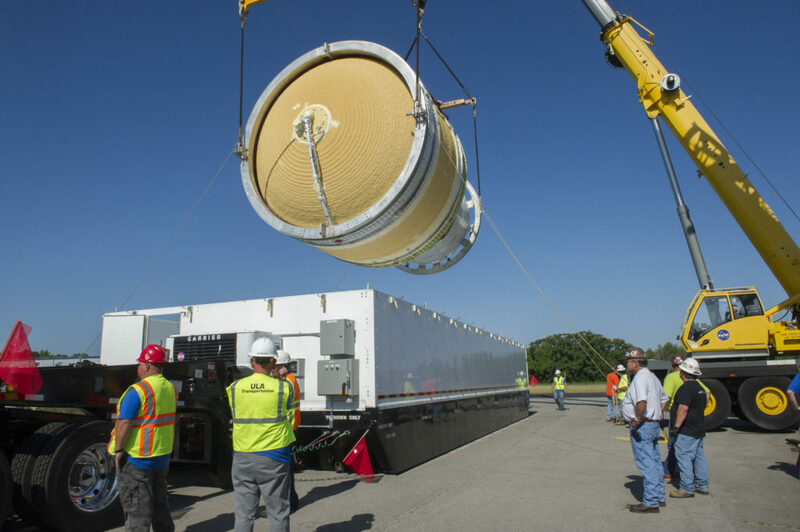 The piece started its journey at the United Launch Alliance facility in Decatur, Alabama, and made its way to NASA’s Marshall Space Flight Center in Huntsville, Alabama. The transported hardware is a prototype of the interim cryogenic propulsion stage (ICPS), and will begin testing later this year. On the first flight of SLS with NASA’s deep-space craft, the ICPS is the liquid oxygen/liquid hydrogen-based system that will give Orion the big, in-space push needed to fly beyond the moon before it returns to Earth. The test version ICPS joins other structural test articles and simulators that make up the upper portion of the rocket. When all the hardware is completed, engineers will stack them together and move the 56-foot-tall structure to a test stand at Marshall. Orion stage adapter — connects the Orion to the ICPS. The adapter technology was used for Orion’s first test flight in December 2014. Core stage simulator — a duplicate of the top of the SLS core stage that is approximately 10 feet tall and 27 feet in diameter. The rocket’s entire core stage will tower more than 200 feet tall and house the vehicle’s avionics and software, and the flight computer. It also will store cryogenic liquid hydrogen and liquid oxygen that will feed the vehicle’s RS-25 engines. A structural test article for the launch vehicle stage adapter (LVSA), which connects the core stage and the upper stage, has completed welding and is now being outfitted with hundreds of sensors to collect test data. Engineers also are continuing work on the logistics behind such a large test operation, including building handling equipment that will transport the hardware to the test stand. For the ICPS, Boeing modified the design of the existing ULA Delta Cryogenic Second Stage, used on United Launch Alliance’s Delta IV family of launch vehicles. It will be powered by an Aerojet Rocketdyne RL-10B engine – also currently used on the Delta Cryogenic Second Stage. Modifications to the Delta Cryogenic Second Stage include lengthening the liquid hydrogen tank, adding hydrazine bottles for attitude control and making some minor avionics changes to meet the design parameters and performance characteristics as needed by NASA to meet the flight objectives. The Boeing/ULA team is working to complete production of the ICPS flight hardware that will launch on the first SLS flight with Orion in late 2018. “We are making great progress on the flight hardware with our ULA and NASA partners,” said Cataldo Mazzola, the Boeing ICPS test manager. The SLS Block I configuration, the first version of SLS, will have a minimum 70-metric-ton (77-ton) lift capability and be powered by twin solid rocket boosters and four RS-25 engines. The next planned upgrade of SLS, Block 1B, will use a more powerful exploration upper stage for more ambitious missions with a 105-metric-ton (115-ton) lift capacity. Block 2 will add a pair of advanced solid or liquid propellant boosters to provide a 130-metric-ton (143-ton) lift capacity. In each configuration, SLS will continue to use the same core stage and four RS-25 engines. ULA is a joint venture of Lockheed Martin Corp and Boeing Co. and has its headquarters in Centennial, Colorado. Lockheed Martin Space Systems of Littleton, Colorado, is the prime contractor the Orion spacecraft.